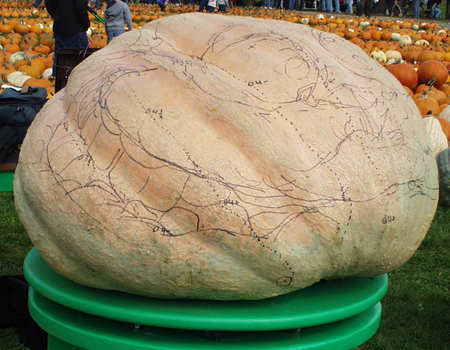 Edgar is a 744lb monster grown by Dan himself at Pumpkinville. Many years ago at the Walk of Terror I met one of his kind. Bobo had a shell of wood and Edgar's hide was even thicker, riddled internally with deep valley cracks . For two days I endlessly chewed away the hide with the microplane graters and hide scrapers. Weight's a guess, as so much material came off mostly as mush lets say at least 111 pounds .